There was a recent report by the Veritas Project detailing how intermediary groups work with Democratic party campaigns and political action committees to stir up trouble for the opposing party. The protests, violence and “bird dogging” that these committees incite were tied to a small group of people working behind the scenes. Well, some dedicated diggers discovered a financial tie between the people working with the shadow group creating media controversies for opposing political parties, and Hillary Clinton’s campaign. Reddit user PepeTheRacistFrog went digging through the official Federal Election Commission database to scour the financial data for each of Clinton’s political action committees after the James O’Keefe video aired on the Veritas Project channel. What they discovered was that one of the individuals in the video turned out to be on the actual payrolls of various Clinton PACs. 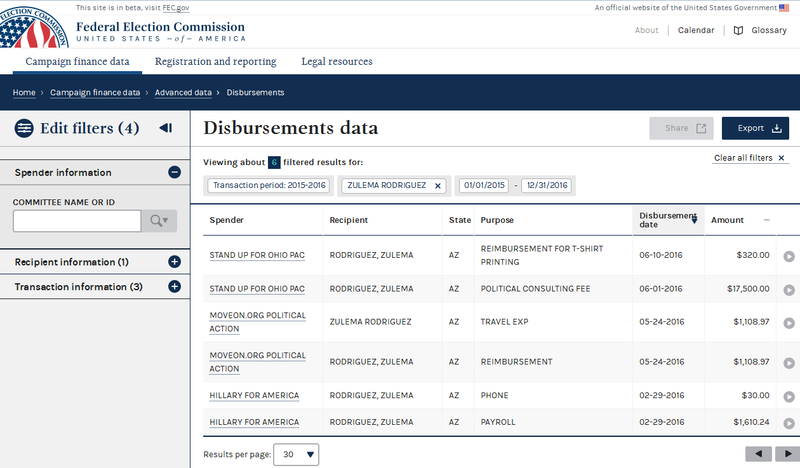 The archive of the FEC site doesn’t work, but you can view a screenshot below showing that Zulema Rodriguez was paid thousands of dollars by Clinton’s committees to carry out “activism”. Rodriguez was paid just under $2,000 by Hillary For America, and a whopping $18,820 by Stand Up For Ohio. The $17,500 was for a “consultant fee” that the committee filed under “Other” on their disbursements sheet. As we pointed out in the other article detailing the disruption tactics of these politically motivated shadow organizations, the Arizona highway stoppage did happen. 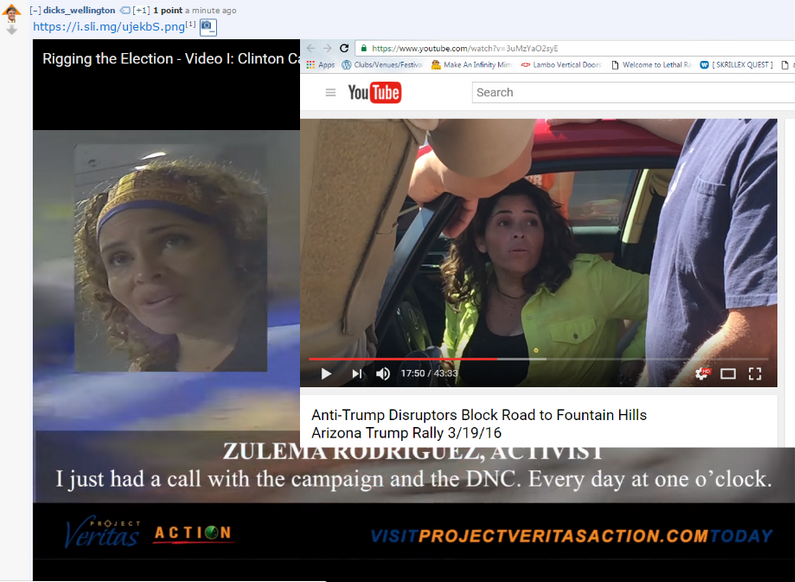 In fact, Reddit user TaintedSquirrel links to an image showing that Rodriguez was at the Arizona protest like she claims she was, thus completing the evident circle of paid activism. Rodriguez was part of a group associated with the Democracy Partners and Americans United For Change. Creamer even pops up in the Podesta e-mail leak on Wikileaks, sending out various e-mails to the Americans United For Change group and the Big Campaign Google groups, both of whom work closely with the Democratic Committee. Both Creamer and Rodriguez admit to getting orders from Hillary’s campaign committee, and now there’s actual financial proof showing that Rodriguez is also on the various committees’ payroll. Rodriguez received her objectives from the field director, Scott Foval, who claimed that everything they did left them with plausible deniability and no paper trail leading back to major Democratic parties. However, the Federal Election Commission seems to have kept a trail for them. Some of their actions were disruptive enough to get the media’s attention, while other actions were geared toward sparking out-and-out violence. So far, there have been no reported deaths spawned from the disruption caused by the Democracy Partners and their subsidiary shadow groups, but there have been injuries, as reported by DNA Info. Nevertheless, the thousands paid to activists like Rodriguez is chump change for groups like Hillary For America, which has spent more than $313 million between 2015 and 2016 alone. They have countless activists across the country who they mobilize to carry out the tasks required of them, whether that be holding up traffic in Arizona, getting punched in the face in North Carolina, or nearly causing riots in Chicago.